"All that I ever needed to be good was to be loved for myself!" Paris, 1881. A mysterious wraith-like being is terrorizing the Opera, blackmailing its directors and murdering those who dare challenge him. Young diva Christine Daae is abducted. Can her lover, Raoul de Chagny, assisted by the mysterrious Persian, the only man to know the Phantom's identity, uncover the secret of the trafic figure who lurks beneath the famous monument ? Until recently there were only three English "translations" of Gaston Leroux's Le Fantôme de l'Opéra. Of the three, Leonard Wolf's 1996 The Essential Phantom of the Opera was the closest word for word translation. Alexander Teixeira de Mattos' 1911 The Phantom of the Opera-rife with deletions of primary material and insertions of new material not appearing in the original-was definitely the least. Finally there was Lowell Bair's 1990 The Phantom of the Opera that attempted a balance between word-for-word translation and overall meaning. For nine years, these three were the only choices available to the monolingual English speaker looking to read Leroux's Phantom. In October of 2004, there emerged a fourth. 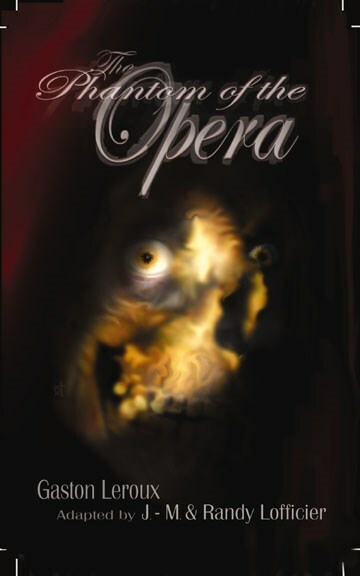 An adaptation rather than a straight translation, The Phantom of the Opera brought to English by Jean-Marc and Randy Lofficier has a flow to it that none of the previous versions were able to achieve. As you may guess from the word "adaptation," though, the Lofficier Phantom is much less a word-for-word translation than any of those that came before it. A husband and wife team, Jean-Marc and Randy Lofficier are translators, authors, editors and award-winning comic book writers. They have written animation scripts for such television series as The Real Ghost Busters and Duck Tales. Their non-fiction works include The Doctor Who Programme Guide, Into the Twilight Zone and the mammoth encyclopedia French Science Fiction, Fantasy, Horror and Pulp Fiction. The Lofficiers are the founding members of Hollywood Comics and of the independent publishing firm, Black Coat Press. Regarding their many French-to-English adaptations, Phantom is far from the first. Other adaptations and adaptation/retellings by the Lofficier team include Maurice Leblanc's Arsene Lupin vs. Sherlock Holmes (1 & 2), Arnould Galopin's Harry Dickson: The Man in Grey and The Heir of Dracula, Guy d'Armen's Doc Ardan: The City of Gold and Lepers to name just a few. Jean-Marc, a French native, met Randy-a Philadelphia-born U.S. citizen-on a trip to San Diego. They began to collaborate on articles, comics, adaptation/translations, etc. shortly after their marriage, although, says Jean-Marc, "The translation is mostly a labor of love… it doesn't really generate much money." Even so, the translations/adaptations are every bit as collaborative as their other work. I generated a rough first draft. Then Randy took over and made it read well. I then reread it and did some very minor tinkering here or there. We compared notes chapter by chapter… until we reached the end. We were both very familiar with the French text before we started (Randy, like myself, is bilingual). The whole project took about three months, but we usually do several books simultaneously. But why adapt rather than simply translate? A straightforward translation usually reads stiff and clumsy as in fact does the original Teixeira de Mattos translation of Phantom. I was quite shocked to discover there were so many chunks missing! That, I had not realized before. What I did notice prior to doing this, was that Leroux's pseudo-journalistic style (somewhat reminiscent of, say, Doctorow's Ragtime) which lends the [original] book an air of fake realism, was completely missing in TdM's version. Indeed, the Lofficier version virtually celebrates this pseudo-journalistic style, perhaps the reason their adaptation is so much more reader-friendly than the straight translations. In French "sauter" means both "to jump" and (more colloquially) "to explode" or "to die." "Il va sauter" could mean he's going to jump, he's going to explode or he's going to die. To be faithful in spirit to Leroux, ideally you'd need an animal whose action/verb means both to blow up and to die. "Grasshopper" completely fails on both counts. It jumps but does not blow up and does not kill. "Grasshopper" completely misses Erik's ghastly double-entendre. It is a very bad translation in my humble opinion. [On the other hand] a frog jumps (though in English we still lose the notion of jumping/exploding) but it also croaks, and there we have the double entendre, a pun [whereby] to croak=to die. For the sake of illustration I've included a chart below with the original French version followed by the Lofficier's adaptation and, to see how that compares to a translation that focuses on individual words first and overall meaning second, Leonard Wolf's. Faut-il Tourner le Scorpion? Faut-il Tourner la Sauterelle? The Scorpion or the Frog? "'The frog! Be careful of the frog! A frog does not only turn: it also croaks! It croaks! As we might all croak when all is said and done!'" To Turn the Scorpion? Or To Turn the Grasshopper? "The grasshopper. Beware of the grasshopper. It's not only the grasshopper that will hop, hop. It hops quite well." I noticed emphases of this sort throughout the Lofficier Phantom and cannot tell you how pleased I am that they came right out and called their version an adaptation. In truth, the original 1911 Teixeira de Mattos' English version might have been better labeled an "adaptation" as well. What with all the additions and deletions Teixeira de Mattos chose to make, his can hardly be considered a straight translation. Nevertheless, both British and U.S. versions of Teixeira de Mattos included a front cover with the title: The Phantom of the Opera and the author: Gaston Leroux and a picture. There was no disclaimer, either on the cover or in the interior, to the effect that the text had been adapted or abridged. The result was that up until 1990, monolingual English speakers believed that certain of Teixeira de Mattos' added passages actually came from Leroux and that there was no more to Leroux than what appeared in Teixeira de Mattos. Perhaps the most striking example of the damage this occasioned to the integrity of Leroux's original work came in 1999. In the preface to his 1999 Phantom sequel entitled The Phantom of Manhattan, Frederick Forsyth called Leroux's Phantom a "slim little book" (based on the 357-page large-print, Teixeira de Mattos version). Ironically, the original Phantom novel, in French, at its full 498 pages (normal-sized print), is more than twice as thick as Forsyth's 177-page slim little sequel. In the case of the Lofficier Phantom, though, the reader knows right from the start that he's getting an adaptation. The Lofficier version is distinct from other adaptations, though, in that it follows Leroux's original very closely: right down to the footnotes. Furthermore, the Lofficier version strives to bring forth some of Leroux's finer nuances, something that doesn't seem to have been attempted in the straight translations. The Lofficiers further personalized their version by including new footnotes. These are in addition to all of Leroux's which are also present. The new footnotes clarify situations that a French reader in 1909 would have taken for granted but that a U.S. reader in the 21st century might find obscure. Examples include historical notes on the Franco-Prussian War, the Paris Commune and the Red Square. To prevent confusion, the Lofficiers differentiate Leroux's own footnotes from theirs with the words "Note from the author." And while on the subject of personalization, the Lofficier Phantom volume includes a brand new story. Written by the Lofficiers themselves, this seven-page piece at the back of the book is entitled "His Father's Eyes." It is clearly marked with a title page all its own as a work written by Jean-Marc and Randy Lofficier. Thus there's no chance of confusing their piece with anything written by Leroux. "Eyes" is a hypothetical work, revolving around a theory of how Erik, the Phantom, might have been born disfigured. Both Erik and the Frankenstein Monster had glowing yellow eyes. The chronology seemed to work, roughly (maybe a decade off but nothing too dramatic). So it seemed like a natural connection. "Eyes" concludes with a quote from Mary Shelley's Frankenstein that could only be described as "Phantomesque:"
Finally, in addition to the Lofficier's textual interpretation of Leroux, the actual book includes forty-seven black-and-white interior illustrations by various artists plus a truly disturbing color rendering by David Taylor on the cover. Each artist was allowed the style and interpretation of his or her choice. Thus, of the interior works, there are those that strive for realism, those more impressionistic or abstract in nature and those rendered in a way that evokes comic book art, even to the inclusion of comic-book-like captions. Of these latter, the one that particularly caught my attention was a line drawing by Gianluca Costantini (page 207) captioned, "No Phantom Movie! Protect Erick (sic) from Hollywood." Those "No Phantom Movie" campaigners of 1998 will of course remember the banner designed by Karin Willison and Miriam Ruth Rocke that was freely distributed to any webmaster willing to post it. The banner slogan read: "No Phantom Movie! Protect Erik from Hollywood!" I'm sure Willison and Rocke would be pleased to learn that their slogan, for all intents and purposes, has now become immortalized as a permanent part of Phantom literature. Of course Costantini's actual artwork is very different from that accompanying the campaign banner. In this specific case, I asked an Italian friend of mine to find me four or five Italian contributors because I wanted some French, Spanish, Italian, American, British, Mexican, etc.-a very international cast of-illustrators. Every artist had complete carte blanche. I do not know Mr. Costantini and I suppose he expressed his feelings! I wouldn't have dreamed of censoring it! For those who pick up a copy of the Lofficier's Phantom and find it to their liking, there is one other piece of original Phantom fiction by the Lofficiers that may be of interest. Available now from Black Coat Press is a collection of short stories entitled Tales of the Shadowmen, an anthology featuring old pulp characters and including one Erik/Arsene Lupin crossover. As for future projects when I asked, Jean-Marc exclaimed, "More books!" In the summer of 2003, Jean-Marc and Randy Lofficier founded Black Coat Press with the goal of bringing classics of French pulp fiction- along with a few more modern works-to the attention of English-speaking readers. Some of these works are adaptations like Phantom while others are full-blown retellings which Jean-Marc describes as "modernized and improved." Especially, he continues, "if they're from some more obscure, yet interesting sources." Although the Lofficier's works are included in the Black Coat Press catalog, so too are the works of many other authors/translators. A list of currently available and upcoming titles can be found at www.blackcoatpress.com.